The latter stages of the Grosvenor 25/25 Series sometimes look more like an episode of Deal or No Deal than the business end of a poker tournament. There was no talk of chops in Dundee over the weekend though as Robert Franks turned his £200 buy-in into a five-figure payout. 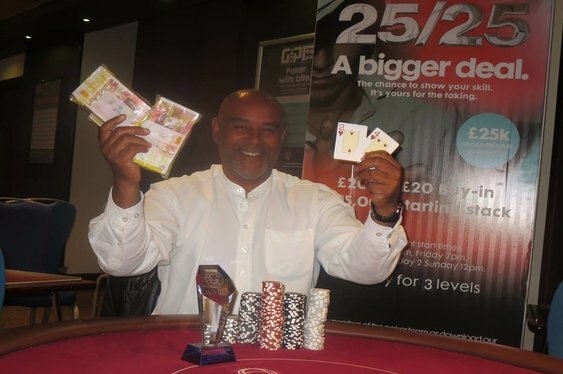 A field of 167 runners took to the tables at the city's G Casino generating a prize pool of £33,400. Franks took the biggest chunk of it after outlasting a final table that included Morag Lawson, Ian Wright, Gordon Anderson and Scott Maxwell. Franks sealed the title with the unlikely holding of 2-4. Colin Gillon moved all in on the 2-4-J flop and was looked up by Frank's two pair. He wasn't without hope though holding a pair and a flush draw. The turn and river blanks though, giving Franks the title and a first prize of £10,030. The 25/25 Series takes a break this week as the GUKPT Cardiff takes centre stage. The £100,000 guaranteed event has two opening flights, starting at 1pm on Thursday and Friday. Satellites run at the venue in the run up and there's also a packed side event schedule. Check out GUKPT.com for details. Image courtesy of the Grosvenor 25/25 Facebook page.